For this week's Make It Monday #271, we can choose any of the previous year's techniques to create our card. I chose Betsy Veldman's Make it Monday #269: Embossed and Outlined Backgrounds. I was happy with the project I did initially, but I was over the moon for these two cards that were entered into the challenge from other card makers I wanted to create my own version. I love the soft color both of these ladies used, and I wanted to try that although I didn't success nearly as well. Well I did, but I couldn't get an accurate photograph so I applied more color. One of the best things about card making is that there are so many incredible "artists" out there to inspire you. That is what both of these ladies did for me. Hands of Time is one of my favorite Papertrey Ink Stamp Sets but I also love the soft pink Diana used so my intent was to try to make one card incorporating both things. Most card makers would not claim to be artists although some do have an art background. But many more (just like me) are just trying to make something lovely to send to a friend or loved one. It's the personal, "made for you" touch that folks like more than it's about the artwork. 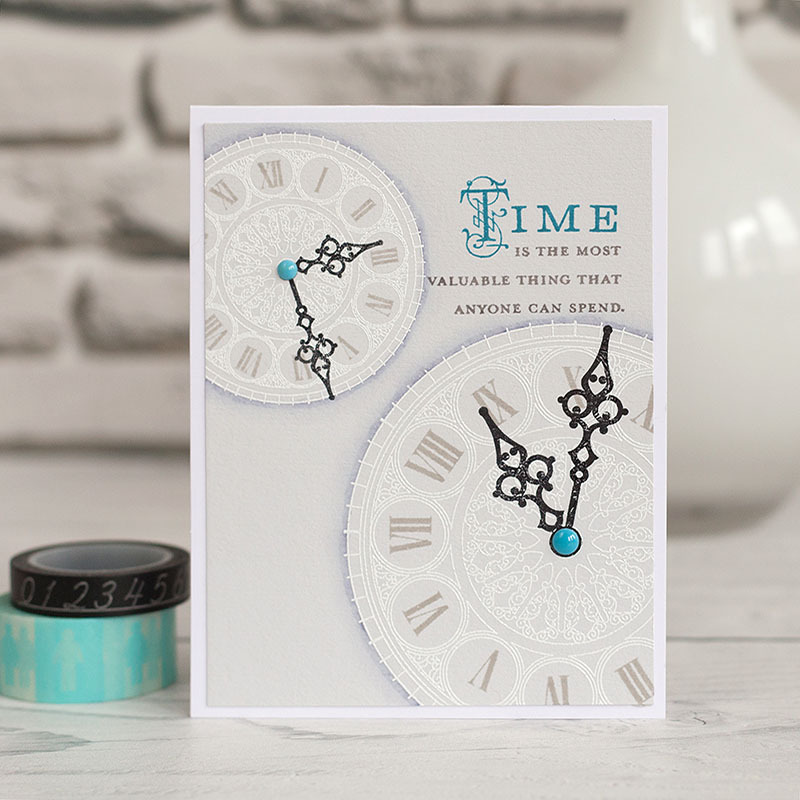 For my card, I stamped the clock faces from Hands of Time onto watercolor paper using Versamark and heat set it using Ranger Gold Embossing Powder. Next I stamped the hands of the clocks and finally the greeting. I carefully went around the clock faces with a C1 Copic Marker which is the lightest grey. Initially I used a light pink Copic Marker, but I like the contrast of the neutral grey better. Once that was done, I used a Mini Ink Blending Tool to add Lovely Lady Ink to the panel being careful to preserve the soft white color of the clock faces. Once the ink was dry, I gave it all a good spritz with Tsukineko Sparkle Sheer Shimmer Spritz. 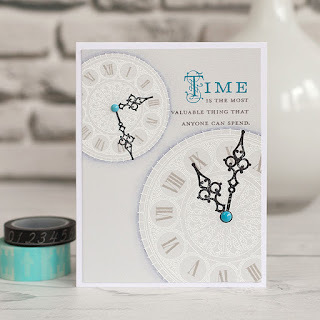 For the clock faces, I added a heavier concentration of shimmer by using my Wink of Stella Glitter Brush Pen and put a pearl at the center of the hands on both clock faces. This made for a fast and easy card that has high impact. Be sure to stop over and visit the Papertrey Ink Blog! Today is Day 2 of posts from the Design Team for Release Week and there's lots to check out over there. This is my last post before CHA as we are doing a bit of visiting with our Kansas friends as well as some sight-seeing on our way to Phoenix. I have two more blog posts for the "Designer in the Spotlight" on the Simon Says Stamp Wednesday Challenge Blog for January 2017 that I hope you'll enjoy; one next Wednesday, January 18th and another on Wednesday, January 25th. I hope you'll come back. Meanwhile, I'll be posting photos once CHA starts! Make sure to follow me on Instagram to see everything. I'm excited to meet other card makers there. I can't wait to see what awaits us all in 2017 and I'm pretty sure Tim Holtz will be the first booth I check out once I get there. I've been watching his sneak peeks on Facebook Live all week and can't wait to see the products in person. Have a great rest of the week everyone! That gorgeous clock wins my heart every time! Embossed in gold, it's stunning! And so perfect edged in pink~ Simply beautiful card, Vicki! I think your card is so beautiful. I love the pink with the gold embossing powder. I have never used this combo, but I can see this in a future project. Really lovely! Wow! Beautiful cards with a thought-provoking message. Just gorgeous, I love the combination of gold and pink. Is there a die for those tiny clock hands? I would love to get them. Simon Says Stamp "New Somethings"